Melbourne Matildas (L-R) Dusty Bursill, Tiana Mirra, Alannah Parfett and Ingrid Torelli. Photo Jim Lee. The full cast, including the title role, for the Melbourne Season of the Royal Shakespeare Company’s production of Matilda The Musical has been announced. 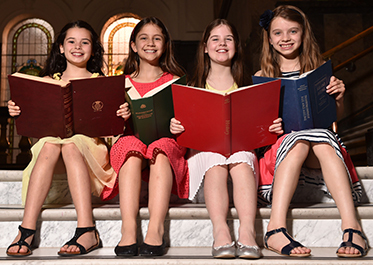 The four young actresses who will share the title role of Matilda are Dusty Bursill, Tiana Mirra, Alannah Parfett and Ingrid Torelli. Matilda The Musical is currently enjoying a sellout season in Sydney and will make its Melbourne Premiere at Princess Theatre from 13 March 2016, with tickets currently on sale from Ticketmaster for performances through to 22 May 2016. Eleven-year-old Dusty Bursill enjoys being outdoors and loves camping and bushwalking. She is an enthusiastic reader and is happy trying different sports. Tiana Mirra is eleven-years-old. She loves short distance running, reading and public speaking. Tiana enjoys spending time with her family and her dog. Alannah Parfett is ten-years-old and an animal lover who also loves music, reading and writing. Her main passion is dancing and anything to do with performing arts. Nine-year-old Ingrid Torelli loves to use her imagination, sing and play in the garden. She likes acrobatics, acting, craft, asking questions about the world and spending time with her family. The full adult cast of the show will transfer for the Melbourne season, including the principals (in alphabetical order), Marika Aubrey (Mrs Wormwood), Daniel Frederiksen (Mr Wormwood), Elise McCann (Miss Honey) and James Millar (Miss Trunchbull). Charli Bowers, Freya Cantwell, Keely Corcoran, Jack Coyne, Jeremiah Duncan, Shyla Farrugia, Tahlia Gerosa, Cooper Guinea, Jazi Hall, Kushinka Jayewardene, Andre Karabajakian, Kathleen Lawlor, Campbell MacCorquodale,Thierry Mendoza, Chloe Ngo, Chihana Perera, Adam Punsalang, Kyle Reynolds, Orlando Schwerdt, Hudson Sharp, Daniel Stow, Alistair Touliatos, Caleb Waterworth, Tahlia Williams and Mackensie Young.